IN THE OFTEN UPSIDE-DOWN WORLD OF ULTIMATE NINJA UK – THE DEVIL’S LADDER PROVES TO BE ONE OF OUR MORE CHALLENGING OBSTACLES..
IT’S LIKE ‘WALKING’ ALONG THE UNDERSIDE OF A SET OF WOODED TREADS – WALKING WITH YOUR HANDS THAT IS WHILE SUSPENDED BENEATH THE STEPS! 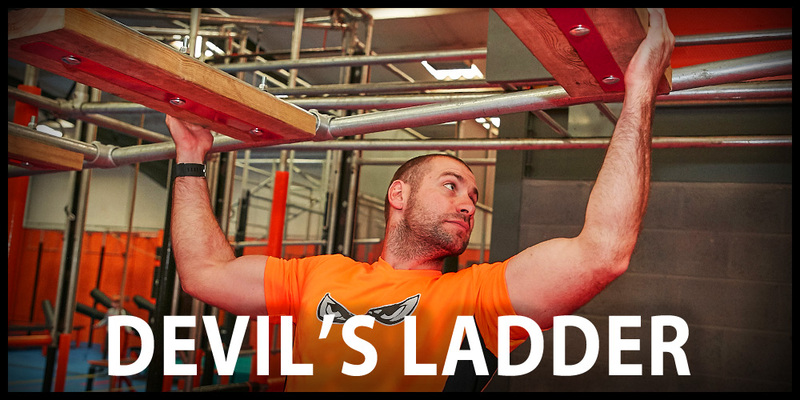 The Devil’s Ladder requires good grip and upper body strength – you need to be able to support, and control, your body-weight as you ‘step’ from tread to tread along the ladder. Some people like to tackle this with their bodies in a static position – others like to swing like a gibbon… What will you do? Think about it before you start. Maintain your technique as you move from tread to tread.